Founded in 2003, Seminario Bautista Panamericano is a distance education school for ministry preparation. All classes are taught in the Spanish language. We currently operate Study Centers in the United States, Mexico, Cuba, Ecuador, Honduras, Guatemala, Nicaragua, Costa Rica, Panama, Chile, Peru, Venezuela and Belize. SBP works with churches of like faith to provide basic yet quality ministry training to those who may not otherwise have the opportunity for formal study. Unlike a traditional Bible college with a central campus and residence halls, SBP operates Study Centers in Spanish-language churches. We have designed the curriculum, produced or purchased the materials, and created a simplified means for a pastor to have a Bible institute within his own church. We believe that ministry training best happens within the church, not apart from it. That is why each student remains accountable to his pastor in a discipleship relationship. Additionally, students must be engaged in ministry within the church as a part of course requirements over the three years of study to put her or his training into practice, and to be a blessing to the church and community. Classes are held once a week. A class session typically runs 3 to 4 hours and includes a prayer time, a quiz or exam over previously studied material, two video lessons and class discussion. A student preaches to the group. Homework is assigned. Outside of class, students read through the Bible each of the three years, serve in their churches, read textbooks, complete projects and memorize Scripture. Emphasis is given on the importance of fasting and prayer throughout the course of study. 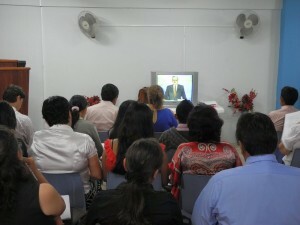 After the completion of all requirements, the successful student is presented with the Certificado en Doctrina Bíblica. God has richly blessed this accessible educational model. Students, pastors and churches testify of the help they are receiving. Please pray as we continually improve SBP, as we expand enrollment and as we prepare to offer the same training in English.